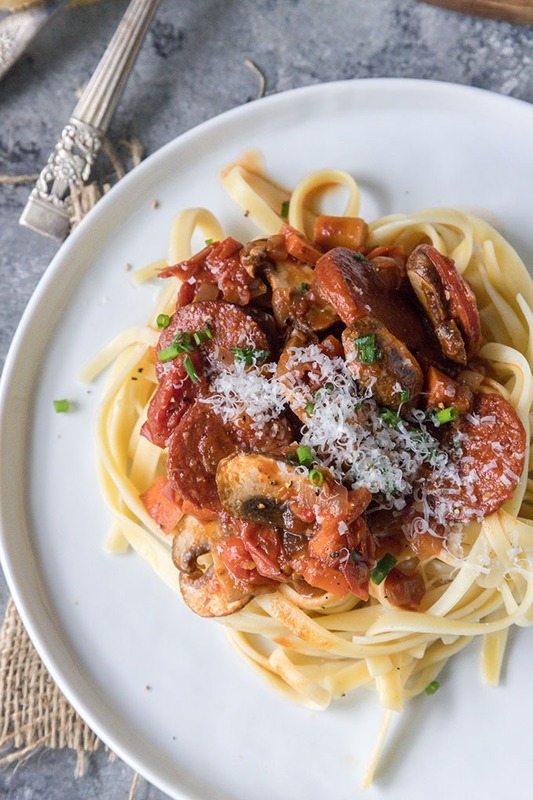 Tomato Chorizo Pasta – a rich tomato sauce, flavoured with red wine, tomatoes, chorizo and mushrooms. 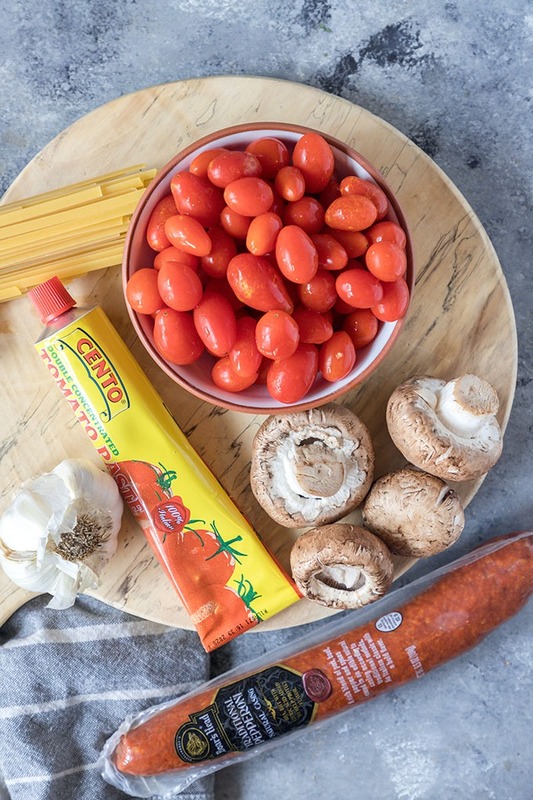 This chorizo pasta recipe is perfect for fall and winter entertaining! Cozy, comfort food at its best, plus this dish is ready in under 50 minutes! Spend less time in the kitchen, and more time with your loved ones enjoying this beautiful pasta dish together! 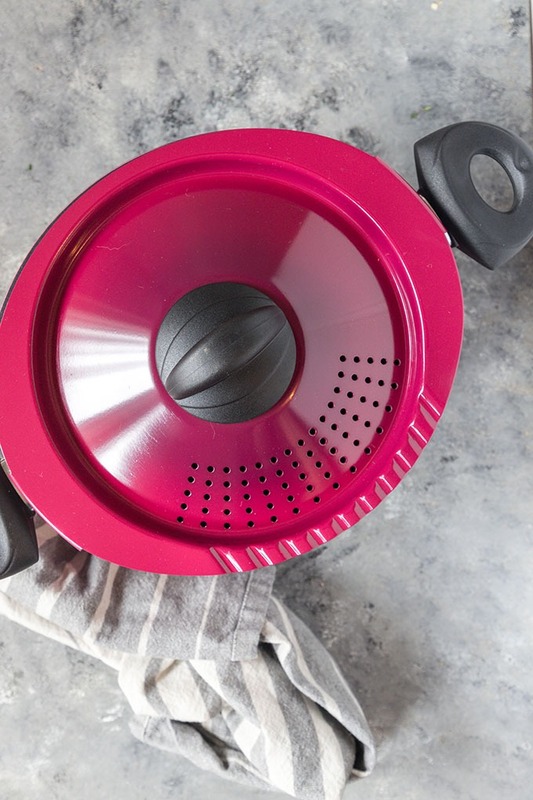 Thank you, Bialetti for sending me one of their pasta pots in exchange for a post on THCK. All opinions are my own, thank for supporting the brands that support The Home Cook’s Kitchen. Proceeds to strain pasta together as one person holds the lid while the other person uses two hands to hold the pot to strain it into the sink. Seriously, ever time! Until now! Bialetti was kind enough to send me one of their pasta pots, and life just got a whole lot easier on pasta night! 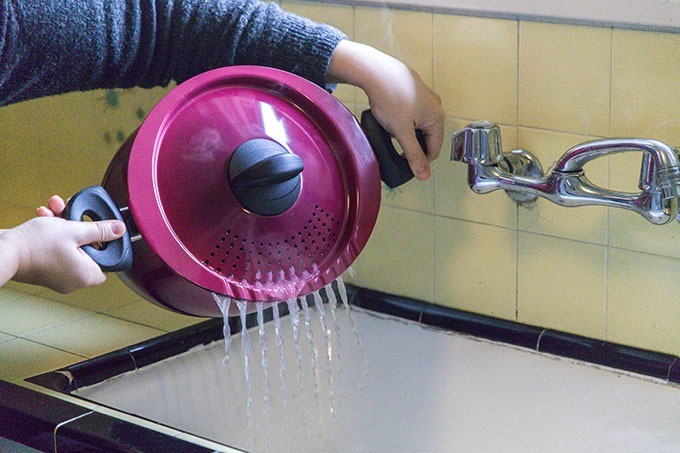 This pasta pot is non-stick, with a handy twist and lock lid, which means I don’t have to worry about burning myself ever again! It is SO easy to use, it took me seconds to strain! The handles don’t get hot either! It’s pretty much become my favourite new thing in my household! It was one of Oprah’s Winfrey’s ‘Favourite Things’ Holiday list in 2016, so it’s good enough for Oprah, it’s good enough for me! Pasta is one of my favourtie foods (have you seen my latest slow cooker beef ragu recipe?! ), so I am totally happy to be able to cook pasta at home free of burns ??. 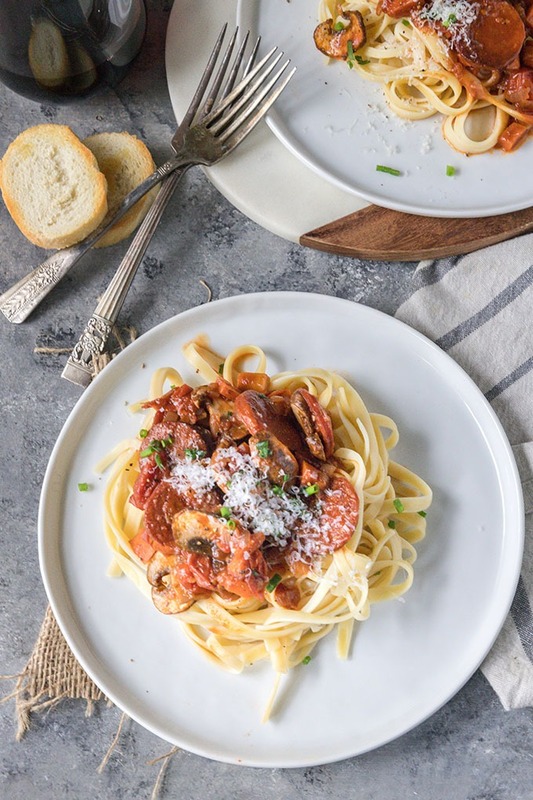 Speaking of good enough, you guys have to try this tomato chorizo pasta! 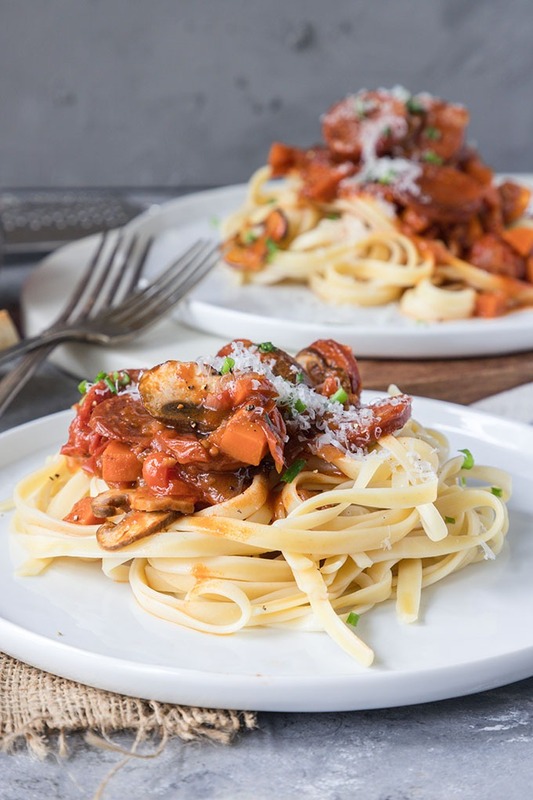 If you can image, a rich and thick tomato sauce, with mushrooms, thick cut chorizo or pepperoni sausage all piled onto fresh fettucini, that’s what you get with this recipe! I’m drooling just thinking about it! It’s perfect for a fall or winter dinner party, date night or easy weeknight meal! It’s super versatile, easy to make and comes together in under an hour all together! The tomato base for this recipe is a combination of fresh cherry tomatoes and tomato paste. I used around 1 cup of small cherry tomatoes and it was enough to create a really thick sauce. The cherry tomatoes burst and break down to create the sauce. For the chorizo – I prefer to use a hard chorizo or pepperoni that I can cut beforehand into slices and then cook. You can find hard chorizo sausage in most supermarkets in the deli section. You can also use a hard pepperoni which is what I did today as my local supermarket was out of stock of the usual chorizo I use. This pepperoni was on the shelf rather than the fridge and can be eaten raw and cooked. I simply sliced it into pieces then fried it off before cooking the pasta sauce. When you fry off the chorizo, you’ll be left over with the oils from the sausage. It’s a good idea to rest the cooked chorizo on some paper towels, however, the oil left in the pan is perfect for frying up the onion and carrot! The cooking time for this pasta is between 40 and 50 minutes. 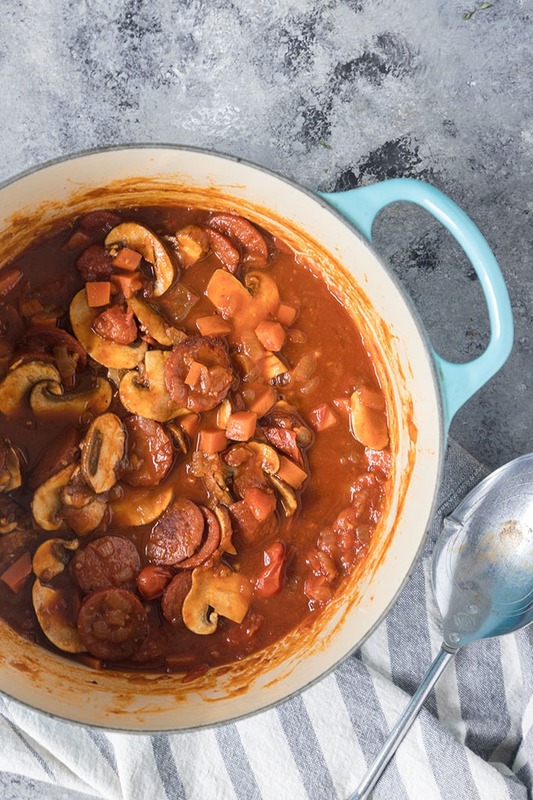 I cook it for 25 minutes, covered firstly without the chorizo, then add the chorizo back in and cook it for a further 15-25 minutes to thicken the sauce with the lid off. The sauce should be nice and thick, however, if you’re finding it too thick, add back in some extra beef stock. I love using fresh pasta for this recipe, however, packet fettuccine works beautifully as well. I tend to prefer to use long spaghetti or fettucini because I just think it looks so pretty and tastes delicious with the sauce. Always cook the pasta according to packet instructions as there is so much variation in cooking time depending on the brand and type of pasta you use. Fresh always cooks quicker than packet pasta for example. As mentioned before, I love using the Bialetti pasta pot to cook and strain my pasta. It is so convenient and cleans up really well. The pasta didn’t stick at all to the pan like it usually does with my other pans! Aside from that, there isn’t really much to this recipe! The end result – a gorgeous and cozy pasta that you’ll keep coming back to as a regular recipe! Have you also tried my one pan cheesy Italian Sausage and Kale Pasta Bake, or my 15-minute Tuna Lemon Pasta yet? They’re also so, SO good for weeknight meals or easy date night dinners! 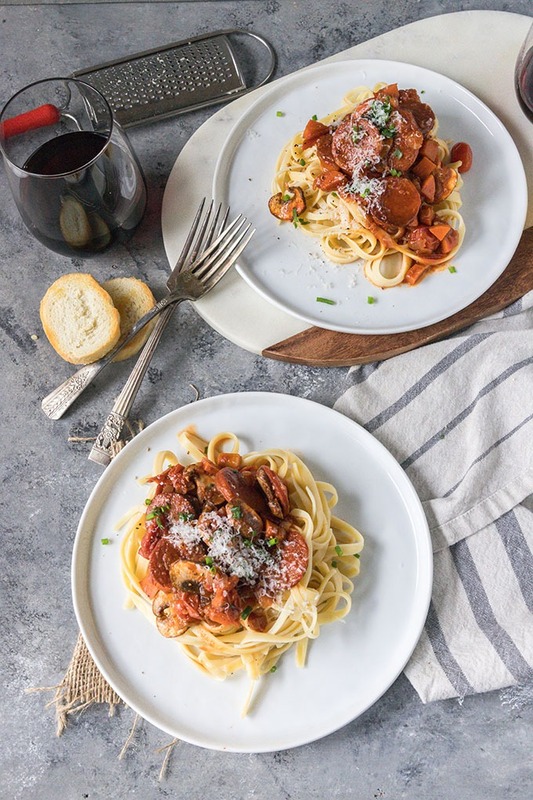 A thick and rich tomato sauce with spicy chorizo and mushrooms, this tomato chorizo pasta is perfect for fall and winter dinners! Heat butter and olive oil in a large pan over medium to high heat. Add the chorizo and fry it off for 3-4 minutes, or until it's starting to brown. Remove chorizo and place on a plate lined with paper towel. Add onion and carrot and fry for 2-3 minutes in the chorizo oil. Add garlic and stir on low for 3-5 minutes, until onion is opaque. Add the tomato paste and tomatoes and stir. Add red wine and beef stock, gently scraping the bottom of the pan with a wooden spoon to release the flavours. Cover and simmer on low heat for 25 minutes. If it starting to get too dry, add an extra 1/2 cup of beef stock. Add chorizo, and simmer 15-25 minutes uncovered until the sauce thickens. Meanwhile, cook pasta according to packet direction. In the last 5 minutes of cooking, add the mushrooms to the pasta sauce. Strain and serve the pasta and sauce with freshly grated parmesan cheese. This looks like my kind of comfort food. I love how much flavour chorizo gives a dish. it’s the best type of comfort food! Wow. This looks and sounds amazing. Loving the pasta pot as well. the pot is so handy! I hate straining pasta without it! That pasta looks absolutely gorgeous! Nice photos! 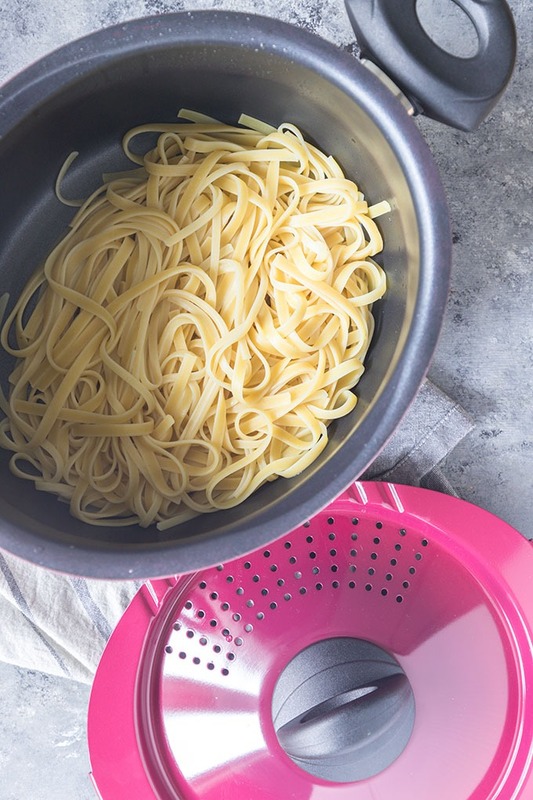 Yep, I think we all need that pasta pot…lol. And if it’s to make such a delicious looking pasta dish, then we need it even more! it is SO handy! I love it! 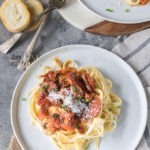 Oh, wow, this tomato chorizo pasta looks incredible! This recipe looks super easy and full of ingredients my family loves. Looking forward to trying soon. thanks Mary!! Let me know if you do try it! My husband would love this! I’ve never thought to put chorizo with pasta! So savory!!! Chorizo in pasta is gorgeous, it adds a beautiful smoky flavour to it!